You never know how you may impact other people with your action and writing. As Nancie said, it is always nice to know that whatever you started is growing, even when you are away. – every XOs are working and are used everyday by kids. They really enjoyed it. – XOs are not part of a curriculum. This is more a leisure activity at the moment. – there is a problem with the local teachers: they only stay one year in the village. We need to train them every year. Teachers need to be more involved in the use of XOs in the classroom. – XOs need to be update to newer versions of Sugar (0.82.1 => 0.88). We need to select specific activities (with good vn translation) and write some pedagogical documentation. We also made some demos of the Sugar environment (on Linux & XOs). Some students present at the meeting are particularly interested in developing Sugar applications. I had a chance to speak to the OLPC Afghanistan Director Mike Dawson about his experience at OLPC Realness Summit, which took place in St. John May 28-31. 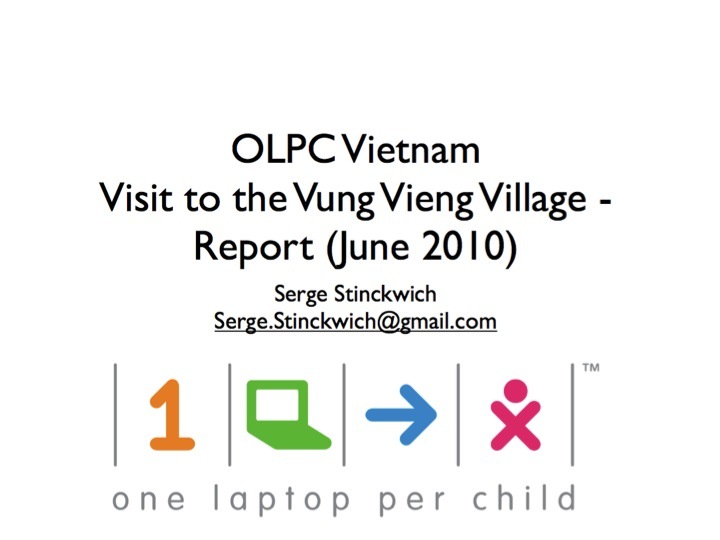 Mike said it was beneficial for him to meet representatives from other OLPC deployments around the world. It was the first time OLPC-doers had an opportunity to meet and talk openly about what has been done and should be done in the future. Unfortunately, not everyone was able to come due to not enough advance notice, but 40 people still made it to the Caribbean to attend the summit and mentor workshop. The ideas have sprung from every continent: to start creating content together, to launch a company to help small deployments, to unite resources to work on software improvements without duplicating efforts, to create user-friendly deployment guides, etc. Everyone had a chance to show to others new tools and approaches. Mike demonstrated eXe, a program that will help non-programmers to create educational games and content in any field for free. (Mike showed to me Hangman letter game, which he was working on when we first talked on Skype several months ago). Afghanistan is waiting for another grant to go forward with planned activities. Besides their similarities, Summit participants also accepted their differences, which is the first step to working together. The differences are about: Which deployments are better: micro deployments or nation-wide? Should XO and Sugar be taught as part of normal school curriculum or extracurricular activity? Who should create software: Academia (Chris) or developers (Bernie from SugarLab argued that Academia takes away fun and constructionism element). Who exactly should help deployments? “By the end of the summit, a strong binding was formed among all the participants, regardless of our widely different professions and approaches to world-wide education. Many of us asked to follow-up by creating some kind of super-organization embracing volunteers from all camps: OLPC (hardware), Sugar Labs (software), educators and deployments. As a representative of Sugar Labs, I’d be more than happy to embrace this idea. We’ve been traditionally been very weak on the education front and loosely connected with deployments. We’ve been trying to solve the problem by attracting people with those interests into our organization, but our overly technocratic community managed to repel them. (He looked surprised. I know he is the Executive Director, but want to know what exactly he does daily.) Sometimes I work up to 16 hours a day, but have to cut down my work hours to not burn out. I lead groups and make sure they all have the capabilities and resources… I manage those groups and resolve problems, work with the government officials. Yes, we have a program for locals 18-19 year old, who in their gap year after high school. They get trained, and then go to schools and help teachers in April for three weeks. They get technical plus teaching experience at the same time. What issues do you foresee? If OLPC switches to a tablet for good, and will not support old models, that will be hard for the existing deployments. Who then gets to decide which school gets new model and which gets old model of XO? Fairness factor will be in question. Then where to get spare parts: batteries, screens, etc. for old models? 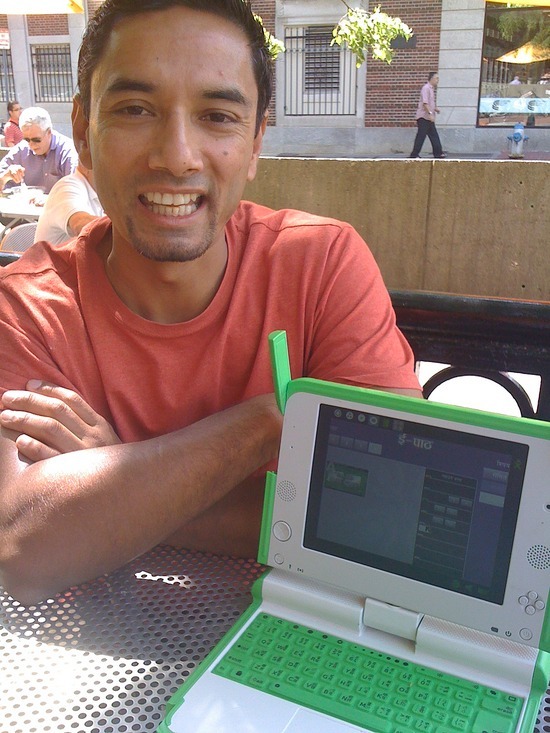 OLPC should focus on making hardware and improving current model of XO, not necessary creating content or education plans. The other problem is that OLPC does not sell XOs to the public directly in small quantities. Should they? What if a private school wants to buy only 100 computers? I will still be in Nepal, running our deployment. There is still a lot of work to be done, especially on getting the government on board. You have to explain what kind of benefits come from the use of computers in schools. We are also thinking about providing consulting services to those who need help with getting XOs and implementing them in their schools. Currently OLENepal has a team of 30 people, 15 of those work on creating local content. Rabi showed us a demo of the activities they created for learning English and math. There is enough content to teach several grades all school year! Nepali text-book curriculum was converted into computer- based and improved. The main advantages of a computer based curriculum are that the student gets instant feedback and has infinite number of practice choices, not to mention a game-like interactive way of learning. The team of creators have to have an educators’ background because as developers they do not know what educators know. Genius techies without any educational experience will not be able to create good programs for students. The goal is to educate all students, not just brilliant ones, but those who are at average and below average. They provided 4 day training to teachers in their first year, now it is 8 days with on-going feedback and support. Teachers are taught different way of teaching: monitoring and helping, not dry lecturing. At the end of the training, teachers convert problems into solutions and they are not afraid of saying “I don’t know but I will get back to you”. It is important to make this process easy for teachers. One of the biggest myths is that you show the teachers what an XO can do and they will create content or customize it. Unfortunately, it is not true. Teachers will not customize it, even if it requires one hour per week, or improve or create. Why? They do not have time for that. Some of them teach 7-8 periods a day. That is why OLE Nepal started with basics – just transferred from book-based to computer based curriculum. And then created lesson plans and sample activities. There should be infrastructure in place. “OLE Nepal has connected all the schools that are part of the pilot program to one another. The schools are also connected to the OLE Nepal central server in Kathmandu, creating an intranet connection between OLE Nepal and its partner schools.Wherever possible, schools have also been connected to the Internet. However, this has depended largely on the pre-availability required infrastructure in the area. In addition to connecting schools to each other and to OLE Nepal, internal networks have also been set up within the schools. Each school is equipped with a school server that contains E-Pustakalaya and the latest E-Paath updates. OLE Nepal wants the Ministry of Education to have the capacity to take over, that is why they have to involve government in the process on many different levels. At one level it means having right people on the board of directors. Another level – involving policy makers into curriculum creation. Training teachers from the Ministry of Education and paying them for training is another example. Last year OLE Nepal trained 15 teachers and then sent them to train others to total of 125. They were teaching ICT basic education – info and communication technology. Not just the teachers, but governments, ministries do not want to lose jobs. Instead of threatening them with new technology that might replace them, it is better to involve them into the process and show how it could work well for all participants. > thank you so much for all your help and comments to my blog saigonolpc. places and seeing the images of the locales and the happy kids. > I noticed you live in Brooklyn, NY. What kind of work do you do there? > sometime in June in NYC. Will you attend?? went to a meeting of OLPC NYC. I would be interesting in attending. I am happy to receive a letter from you. Unfortunately, my red computer was stolen and I lost all my pictures from Vietnam and all pictures with you. If you still have some pictures, please send them to me. I am working right now on starting a company that will send more teachers to Vietnam and other countries. And I hope I can come and visit you again!